Did you know that if you get custom garage cabinets in Phoenix it can improve your home? How Can Installing Garage Cabinets Be the Ultimate Home Improvement? Garage cabinet installation is a perfect example of the type of home improvement project that can benefit you in a number of ways. The most obvious benefit will be the fact that you can have the one thing that eludes most people, you can have a garage that is actually neat and organized. The average person’s garage is an unsightly mess, the result of having anything and everything not of immediate need to the household thrown into it. Sure, you probably intended to go and put the holiday decorations away, but never got around to it. Then you threw in a box of old clothes you were going to donate, but never quite go around to doing. Before you know it the little bit of this and little bit of that you have thrown into your garage can grow into an enormous pile of clutter. If you have ever opened your garage door to go and get something only to be deflated upon seeing the state of your garage, then you need to get garage cabinets. When you have garage cabinet installation performed by a professional you will have a place to neatly place everything that just seems to pile up in your garage. And if you have questions about garage cabinets, they can answer them as well. Instead of having to search for a place to put something you don’t need right now, you can organize your garage so that you have a spot for everything. Instead of having to spend countless hours digging through the rubble to find what you need, you can simply go to your garage cabinet and retrieve it. Garage cabinets will enable you to organize your garage and avoid that awful pile of clutter that seems to plague most houses. So you’ve decided to have a custom cabinet installation job done in your garage. Good for you, but now what do you do? One thing you don’t do is try to tackle this project yourself. Sure it may look easy enough, but everything looks easy until you actually get down to trying to do it. The number one reason that most home improvements projects are attempted by the homeowner is an attempt to save money. However, there is saving money and there is saving money by getting an investment that will add value to your home. 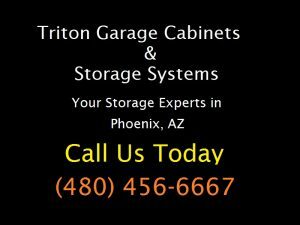 Call your garage cabinet showroom in Phoenix today for more information.